One of my favorite things about the Keto diet is that meat and seafood are virtually zero carbs! I eat steak at least once a week and seafood almost as often. One of my favorite meals is Steak and Lobster! Here I’m going to share with you my easy Steak and Lobster Recipe! For this recipe I used Ribeye Steaks and Cold Water Lobster. First let’s marinate our steaks! You can do this a day ahead of time, to an hour ahead. I prefer to do it at least 4 hours ahead. They don’t call me Lazy Keto Girl for nothing. I like simple and easy so I use a store bought marinade by McCormick Brand. But I’m going to provide you with another Low Carb Steak Marinade Recipe that’s really good in the near future! I use McCormick’s Grill Mates for a lot of things, but my favorite is their “Montreal Steak” and no, I don’t use it for only steak!! In the picture above I show a small bottle, but guys and gals these little bottles do not last long you WILL NEED a big one that is shown below; if you get HOOKED like me! Unwrap your steaks from the plastic, try and keep the plastic intact so you can recover your steaks with it. 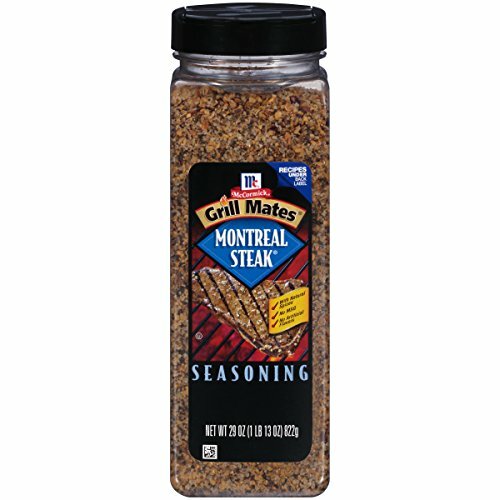 Sprinkle Montreal Steak seasoning and Sea Salt over steak on both sides. Pour a dab, about a teaspoon full on each side of each steak and rub it in! Place plastic back on to steaks and put them in the fridge. Let set your desired marinade time – I like around 4 hours. Be sure you bring the steak out an hour or two prior to cook time to let them come to room temperature before cooking. Normally I love to cook outside on the grill, but it is winter time and I am out of proprane… so inside it is. I LOVE grill marks on my steak, and NOTHING tastes better than cooking in cast iron baby – NOTHING! The pan shown here is the exact one I have, but I spent WAY MORE $ at Walmart for it. So if you have Amazon prime – go that way! I wish I had known that before my purchase. Steps to Cook Your Steaks! You should hear a nice sizzle as heard in the video above. Let each side good for about two minutes. Rotate steaks a quarter of a turn to get those grill marks. I only do this criss cross on one side – hey I’m lazy remember? Flip steaks. Let cook for maybe a minute. Using hot pads, move steaks to oven. For a pinker steak, let cook only about 3 minutes more. For well done you can cook up to 7 to 10 minutes – my hubby doesn’t like any pink in his. (That’s ok I just get to eat before him). So Now for the Lobster! Yes you can cook these together but you need a higher temp for the lobster and it will need to cook longer than the steaks. Steps to Cook Your Lobster! First you will need to prepare your lobster. Wash and dry lobster tail. Using kitchen scissors butterfly your lobster (see video below for details). Place on foil lined pan and cook for 15 to 20 minutes. Make some melted butter with lemon and garlic salt to dip it in! Tagged lobster, Low Carb Steak Marinade Recipe, sauce, steak, steak and lobster recipe, steak sauce. Bookmark the permalink.